Over the past few months Sergey Kovalev (33-3-1, 28 KOs) has heard all of those words and a few that have been much harsher. Who can really blame them? Ever since Kovalev lost to now retired future hall of famer Andre Ward by knockout he just didn’t seem like his normal self. Sure following that defeat he went on to win his next two fights by knockout, he even managed to win back one his titles that he lost to Ward in the process but still something just didn’t seem right. Kovalev once had an aura of invincibility. He wasn’t just beating very good fighters he was flat out dominating them. An undefeated Nathan Cleverly was stopped in four rounds. Jean Pascal who had been known for having a granite chin was stopped not once but twice by Kovalev. Even the legendary Bernard Hopkins was dominated when they matched up back in 2014. When Kovalev stepped in to the ring with Ward and ultimately lost both contests it wasn’t an indictment on Kovalev, after all Andre Ward is one of the best to ever step foot in the ring but that aura that he once had took a major dent. Kovalev lost a piece of himself in those defeats. That thought process rang true when Kovalev was knocked down three times and subsequently stopped in the seventh round last year in his match against Eleider Alvarez (24-1, 12 KOs). Before the stoppage win Kovalev was winning on the scorecards but Alvarez would not be denied as he simply bullied Kovalev on his way to victory while snatching away Kovalev’s WBO Light Heavyweight title in the process. Instead of simply accepting that defeat Kovalev wanted an immediate rematch. We all knew what was going to happen next. Kovalev was going to suffer a vicious beating at the hands of Alvarez and be relegated to the bottom of the division. It seems as though he didn’t get the memo. Kovalev put on one of the very best performances in his career by boxing circles around Alvarez enroute to a unanimous decision victory this past Saturday night. It was a masterful performance. Kovalev has collected victories over tougher foes in his career, however this past Saturday night he not only had to deal with a dangerous, younger and more fresher opponent but he also had to battle himself as well. During the entire build up of his fight he told everyone that would listen that what happened in his first fight with Alvarez was a “mistake” and that he has “improved.” Few believed him and even fewer picked him to win the fight. He made them all look foolish. Kovalev is known for his punching power and maybe to some degree relied on it too much in the past. This past Saturday night he proved that he is much more than a one trick pony. The Light Heavyweight division has a ton of talent. Current undefeated champions Artur Beterbiev, Dmitry Bivol and Oleksandr Gvozdyk are at the top of the charts. Before Saturday nights win Kovalev was just an after thought. A blimp on the radar. A non threat. Now? He has forced himself back in to the top of the division. 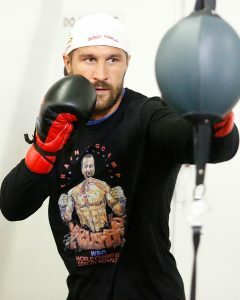 Kovalev is getting a bit long in the tooth at 35 years of age but he still has plenty left in the tank. This Saturday night proved that he isn’t done just yet.